The musical movement in opera known as verismo (realism) went from 1875 (Bizet’s Carmen) to about 1900 and possibly even later, depending how your local music critic feels about Puccini. 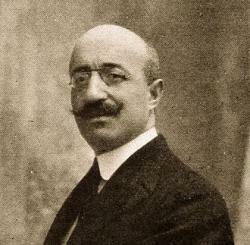 In any event, Francesco Cilea is one of Puccini’s contemporaries who composed in that period. He is best remembered, no doubt, for Adriana Lecouvreur. It is not the only thing he wrote, but that is what comes to mind. In that respect, he shares the fate of other Puccini contemporaries such as Ruggero Leoncavallo (Pagliacci) and Umberto Giordano (Andrea Chénier and Fedora), all remembered for only one or two operas. Cilea was born in Palmi in Calabria. He was musically precocious and was sent to the San Pietro a Majella conservatory in Naples. He was an “honors” student, and his first opera —his “graduate thesis” at the conservatory, as it were— was Gina. It was performed in 1889 at the conservatory theater and attracted attention from a publisher, who then commissioned a verismo piece from Cilea. His career had begun. That opera was La Tilda. It played in 1892 in various Italian venues and abroad in Vienna, but has since become totally obscure; even the score has been lost, so it cannot be accurately recreated. Other early works were performed elsewhere in Italy (not Naples), including L’Arlesiana in November of 1897 at the Milan Lyric Theater. The libretto was by Arturo Leopoldo. It includes the aria, il Lamento di Federico, sung for the first time by Enrico Caruso. The opera was not performed at San Carlo in Naples until 1930. That single aria from L’Arlesiana is still popular and is often performed by itself in concert. Adriana Lecouvreur, itself, with libretto by Arturo Colautti, premiered in Milan at the Teatro Lirica in November of 1902. Cilea’s last opera was Gloria, with libretto by Arturo Colautti; it premiered at La Scala in Milan in April, 1907, directed by Arturo Toscanini. Cilea composed some instrumental music, including a symphonic poem with text (1913) dedicated to Verdi as well as a number of works for the piano. After his last opera, he became director of the Bellini conservatory in Palermo and then the San Pietro a Majella conservatory in Naples, a post he held until he retired in 1936. Cilea appeared in public even late in life; in February of 1950 he received a grand ovation at the performance of his Adriana Lecouvreur at San Carlo in Naples. He died in November, 1950 in Varazza in Liguria. The conservatory in the city of Reggio Calabria, not far from his home town, is named for him.